★ iGeekid Aqua Doodle Pad -- The best safety doodle toys. Let us start painting to find more interest! ✦ Water Drawing Mat,large size design. ✦ Unique purple dinosaur pattern,unlimited use. ✦ Exercise children hand-eye coordination. ✦ Strengthen children 's color ability training. ✦ Cultivate a more intimate parent-child relationship. ✦ No matter where you are, your kids can easily play on the road a few hours of entertainment! ➊ Unscrew the nip clockwise in the direction of ON. ➋ Filled with clean water. ➌ Tighten the nip counterclockwise in the direction of OFF. ➍ Start painting (reused, about 3-10 minutes after drawing, content will automatically disappear, can be unlimited re-use). ①.It is better to put the head of the pens into water to soak for 30 minutes if the pens can not work smoothly at first use. ②.The mat can only be written with water. Not machine wash, keep away from the heat,You can wipe the surface of the canvas with a damp cloth, then air-dry it. ③.Four drawing pens without pen cap is to avoid the risk of swallowing. iGeekid strongly stands behind each item it designs and sells. Each product is backed with a one-year warranty and 100% Satisfaction Guarantee. If you have any questions on our products, please feel free to contact us! THE LATEST DESIGN: LARGE SIZE & 6 COLORS & 8 TEMPLATES Unlike ordinary doodle mat,we designed Unique Dinosaur pattern, and using the most popular Purple nowadays.-- Size: 29.5 x 20.47 inch. Large size allows a couple of kids to play at the same time.The changes of 6 vivid colores can fully stimulate the child's creativity and imagination.8 templates make it easy for kids to get started.4 clips design can effectively prevent from pen lossing. SAFETY & REUSABLE: Fill the pen only with clean water write and draw, no ink and no chemicals required! safe and environmentally friendly. Magically disappear after 3-10 minutes (depending on the temperature and air flow), kids can draw on doodle board mat again and again.Allowing your children to play in a safe environment. 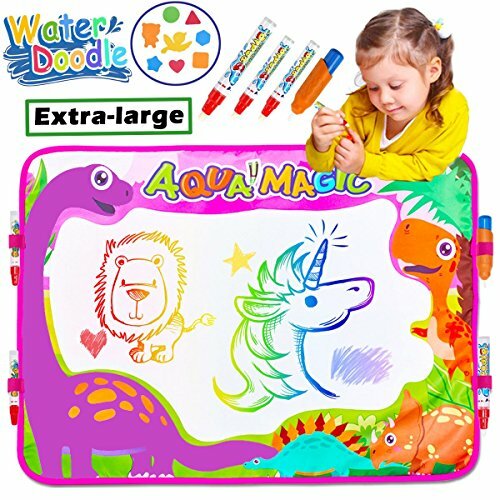 HIGH QUALITY & NO MESS: iGeeKid Aqua doodle mat designed: Canvas front fabric: 35% cotton 65% Polyester,Polyester and cotton is clean and safe for babies and children.Canvas reverse: water-resistant nylon material, no worry about wetting the floor.The kids can color and doodle with water on the drawing pad,no worry about the mess. CONVENIENT & PORTABLE: Aquadoodle pad made of polyester fiber non-woven fabric,softer and collapsible.Very portable for travel,easily fold up for storage. It is a very educational toy and a best choice of Birthday gift for kids indoor or outdoor,picnic party. 100% SATISFACTION GUARANTEE: iGeeKid strongly stands behind each item it designs and sells. Each product is backed with a one-year warranty and 100% Satisfaction Guarantee.Great gift for kids to practice painting,Inspire your kid's creativity and imagination, exercise hand-eye coordination & the color perception ability, learning cooperation. View More In Drawing Tables & Boards. If you have any questions about this product by iGeeKid, contact us by completing and submitting the form below. If you are looking for a specif part number, please include it with your message. Adult Coloring Book Sketchbook Carrying Case. 12 Vibrant Colored Pencils, Sharpener, and Supplies Pouch for easy Personalization. Universal sized Holders for Color Books Drawing Pads and Pens.